Don't let unpleasant odors be the first thing visitors encounter upon entering your home or business. 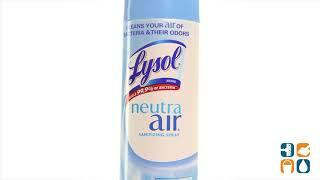 When used as directed, Lysol Sanitizing Spray destroys odors in the air and kills 99.9% of odor-causing bacteria. Bacteria is killed at the source, unlike perfume-y air fresheners, so odors do not come back. Comes in Revitalizing Fresh Breeze Scent that is subtle and pleasing, but never overpowering. Order yours today. Stock up and save more!